Chestnut stuffing has always been one of my favorite comfort foods and I have been experimenting with it for quite a while now. This version is my favorite so far. Melt the butter in a large, heavy skillet. Saute the onions until softened, about 5 minutes, then add the herbs. Mix and add the stock, and bring to a simmer. 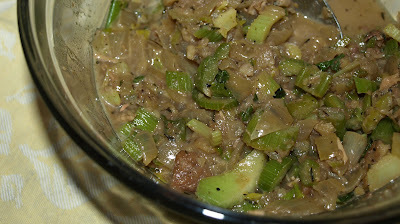 Add the celery and chestnuts and cook until they are soft, adding additional stock if needed. Taste and add salt if desired. This will depend on how salty the stock was. For "rice stuffing", add a grated cauliflower at the end. You may need to add additional stock as well. For bread stuffing, I used the nut butter bread recipe although coconut bread may work as well. Cut about half of a loaf of bread into cubes. If you feel that the bread is too soft, you can slice it and toast it first. The cubes can then be added to the above recipe at the end and cooked until they are softened and have absorbed the liquid. You may need to add extra stock or butter. I don't know where exactly I can comment on this site in general, so I figure this is as good a place as any. I would just like to say that I'm planning on starting GAPS really soon (As soon I get the book I'll start experimenting, and as soon as ramadan is over I'll start. I just don't want to be fasting and cleansing at the same time), and as a Muslim with a severe milk allergy, NO diet ever has a realistic collection of recipes. Other than the odd pork recipe, this is the first really large collection of recipes that is me-friendly! I'm pumped about starting GAPS, and am feeling really encouraged and supported just by looking around at all the recipes here that I can actually EAT without changing anything! That is wonderful to hear Summer, and best of luck to you! I've never worked with chestnuts before. There are many different methods to peel and cook them and get them out of the shell posted. What stage should they be in for this recipe?